A new paper in Science Advances by Penny et al. suggests that climatic fluctuations which stressed Angkor’s urban hydraulic system may have ultimately contributed to the city’s ‘demise’. 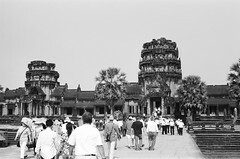 The conclusions were reached from computer simulations modelling the effect of monsoon rains and droughts onto Angkor’s urban infrastructure. Our cities are extremely vulnerable to climate change. Archaeological research on ancient Asia & beyond shows how modern cities could adapt or collapse.